Sometimes after your interest in a game has waxed and waned and you think you’ve plumbed the depths of the value you can get out of it, occasionally it’s a good idea to reinstall or boot up old titles to see if there’s anything you missed out on the first time around. This happened to me recently with Warhammer 40,000: Space Marine, Relic Entertainment’s foray into third-person character action games. I liked the game quite a bit when it first came out (you can read my review here), but in the intervening time Relic added a co-op horde mode to the game called Exterminatus, which I missed out on the first time around. It follows the usual horde-mode set-up of allowing you and three friends to battle through 20 waves of enemies with occasional objectives, but what makes it shine is Space Marine’s solid gameplay. I had forgotten how fun and satisfying Space Marine felt to play. 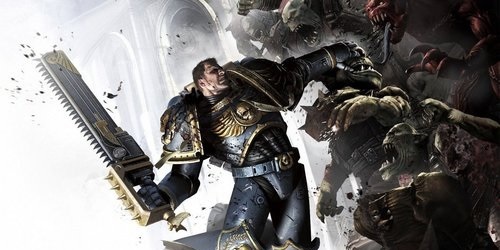 Considering that your average Space Marine is built and looks like a walking tank, it might be easy to forget that the melee combat in the game is fast and fluid, and the shooting benefits from the combat-roll ability which is basically your “get out of jail free” card when you’re being mobbed by Orks and don’t have a chainsword handy. Add in two or three friends backing you up against insurmountable odds and throw in a bunch of frenzied yelling when you’re up against the wall and you barely manage to pull through and win a round and you’ve got yourself a really good time, especially out of a game that I had pretty much given up on a couple years ago. Has anyone else experienced this? Have your friends ever dragged you back to an old game that got some post-launch content that you originally passed up on, only to find yourself having an awesome time? @Vanilla Bear World at War definitely had the best Zombie mode of all the Treyarch Call of Duty games. The original level in the run-down building in the woods is a classic. BTW Space Marine is a good time, but the multiplayer is totally dead, sadly. It was pretty fun! @playersbro Terrorist Hunt is an amazing game mode, shame I don’t have a 360 anymore for that. I own Rainbow Six: Vegas 2 on PC, but it’s a pretty awful port. Previous Previous post: GamerSushi Asks: Gaming Christmas?